3 1/4 x 4 x 1 3/4 in. Object consists of joystick with attached cable and original cardboard box with two folded cardboard packing inserts. The attached cable is terminated with a DB-15-S connector.. Dimensions and color are of the joystick, excluding the attached cable.. The dimensions of the largely gray box are approximately 2 1/4 x 5 x 7 in.. The joystick has two 1/2 inch-diameter round red buttons, one on each side.. 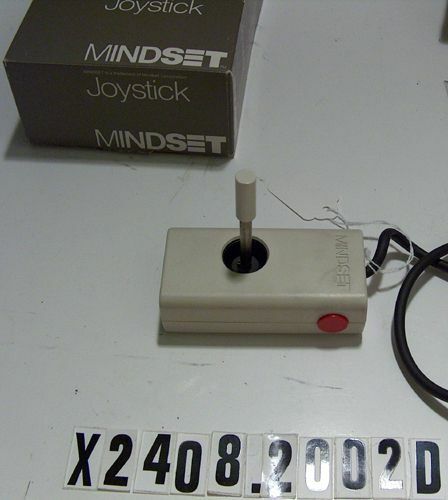 The name Mindset is molded into the top face of the joystick case.